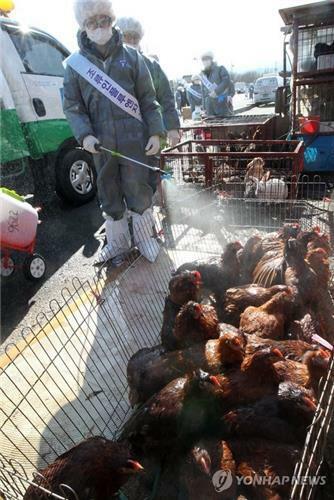 The research arms of South Korea and the United States devoted to dealing with wildlife diseases, have joined together to cooperate in tackling avian influenza, rabies and other animal-transmitted diseases, a state-run think tank said Thursday. The National Institute of Environmental Research signed a letter of intent early this month with the National Wildlife Research Center, a research facility within the U.S. Department of Agriculture, to carry out joint research activities in the sector of infectious diseases caused by wild animals. The U.S. organization teamed up with the South Korean body in the sector for the first time, the NIER said. Under the deal, the two groups plan to conduct joint research in the surveillance and investigation of zoonoses, or diseases that can be passed from wild animals to humans, and to make academic exchanges and develop cooperative programs. They will also host an international symposium on highly pathogenic avian influenza and wildlife-transmitted infectious diseases at the U.S. center's headquarters in Madison, in the U.S. state of Wisconsin, in August. The NIER expected that its cooperation with the U.S. body will enable it to share a wide of experience and expertise held by the NWRC, leading to enhancing South Korea's ability to monitor and cope with wildlife-transmitted infectious diseases.